Other panels available upon request. Send an email to custom@omega.com for pricing & availability. Custom panels are $1000 minimum order for custom SKU part number. *Insert thermocouple calibration code: J, K, T, E or U. 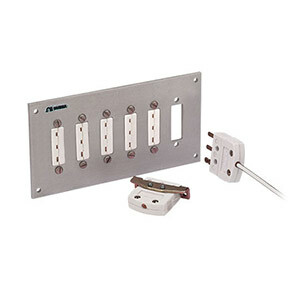 ** 6 mounting holes per panel. 참고: Consult Custom Engineering Department for information on custom color-coded anodized panels. Non-standard panels: $1,000 minimum order. Contact custom@omega.com for pricing and availability.